Great tips – I always wonder what to get my elderly father and the digital memory clock sounds like an interesting idea, especially since he’s always forgetting what day it is! He doesn’t have alzheimer’s but he does struggle due to meds. Thanks, Ruthie! Glad it was helpful. I tried to think of things that would have been helpful for my dad who was almost 91 when he passed away last year. Joyce – that is so good to know. Thanks for sharing your first hand experience! Great ideas – all of them. My in-laws have downsized, and it’s always a trick to keep the clutter to a minimum! Veronica, I hear ya! I picked things that I thought my Dad would like when he was in assisted living. Thanks for reading and commenting! The digital frame is the perfect gift for my father, especially since he live in Georgia and my daughter and I live in Texas. Celeste – where in Texas do you live? Have we had this conversation before? I live North of Houston. Thank you for these ideas. Could you post a few ideas for husbands too? Linda – on the MySideof50 Facebook page, I put up another bloggers post with some great Father’s Day gift suggestions – some that husbands would like. They ARE hard to buy for, aren’t they? These are wonderful suggestions and perfect for an elderly man. Thanks, Carol. I picked things that I thought my Dad would like when he was in assisted living. These are great suggestions for gift items! My parents are currently looking into an ALF and are in the process of downsizing so these are perfect ideas! Thanks so much. Mary – glad you liked the ideas. Thanks so much for reading and commenting! Hey, I could use that large button remote! Seriously, these are great ideas. I was actually hoping to find a birthday idea for my husband, who isn’t elderly but has everything. Sigh. Some great ideas Cathy – I know I’ve seen my in-laws and my mum get a lot of pleasure out of a digital picture frame and those digital clocks are amazing. Good to know Leanne. I bought a digital frame for a friend’s 90th birthday. She has lots of grands and great-grands! These are all fantastic ideas. I never knew about that clicker! Great list and thanks for sharing it with us. Cathy – I knew there were remotes with big buttons, but the feature that “hides” the setting buttons so that you can’t mess it up is the best! Thanks for reading and commenting! Never mind elderly parents — that remote spoke to ME. I totally need one. Last year we gave the digital frame as a gift to elderly parents and it didn’t work out so well, but I love the idea of the large buttoned remote. Patti – a lot of people like that remote = and not just for elderly Dads! Thanks for reading and commenting! Great ideas for senior fathers! I’m going to share this on my Facebook page. I’m sure some of my readers will really enjoy it. I lost my father when I was only 15 so I don’t have a father to buy for but many of them do. Rena – I’m especially glad you think the ideas are good. I just lost my Dad last year, so these ideas came from things I thought would be helpful and appreciated in assisted living. Thanks for sharing with your group! Me too, Rebecca! Thanks for reading and commenting! All great gift ideas, but boy that remote sounds amazing! Doesn’t it? I need one I can’t mess up too! These are fabulous suggestions and I am going to share them with the caregiver group I used to work with. For me this is the second year without my dad, I miss him so much. Lucky for me I have 3-son-in-laws and a son who are amazing fathers and I am looking forward to celebrating them. I know what you mean, Doreen. This is my first year without my Dad & I have been really missing him. Thanks for sharing my post. Maybe it will give people who don’t know what to get some useful ideas. Your gifts are so great, my husband and I have some of them like the clock! Thanks, Janice! I know – I say these gifts are for the “elderly”. I guess I qualify too! These are excellent suggestions! I never know what to buy any of our elderly relatives and most of these would be perfect! With a few tweaks for the ladies. Pinned! We did a digital frame for my parents once too. They loved it. Kellie – that is good to know. My mom had one and it was something she always enjoyed. Wow, these are all great ideas! I can never figure out what to get my dad but I’m thinking he would love that remote! I think it’s hard to buy for men in general – especially our Dads! Glad you found an idea in the post! These are great ideas! 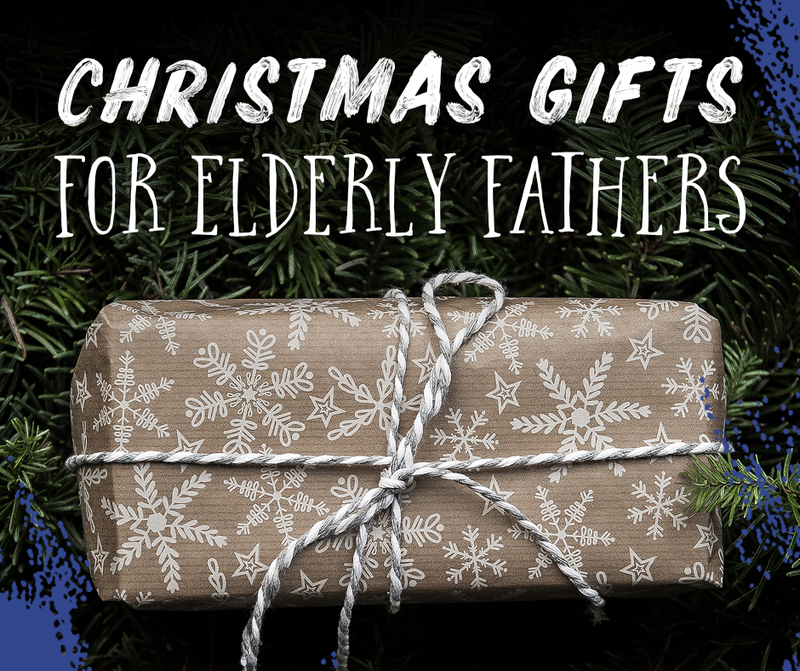 Sadly I don’t have an elderly father to buy for, and either does my husband, but I think these are gifts that any older man would love. Thanks for sharing at the Blogger’s Pit Stop. Debbie – I lost my Dad last year, but in thinking about it think I found some gifts that he would have liked and appreciated. Thanks for reading and commenting! These are great tips. Wish I’da had the oversized playing cards for my dad! Another good gift is an audio book player, fully loaded, which is very easy to use. My dad loved it. Susan – great suggestion! I did not think of that! Yes – that can be so useful. My dad always wanted to know what time it was! Great gift ideas for an older man for sure. I’m sure my father would have loved some of these suggestions…. This one is always a challenge. My father does not want or need stuff. What he does love is food gifts. He doesn’t cook, and the best gift he ever got was when my niece gave him a huge box of frozen meals. What she did was every time she cooked a meal she froze a portion in a small container. She labeled them and added heating instructions. My Dad was thrilled! Michele – that sounds so wonderful. I made a lot of meals for my dad that last few months of his life. You are right – they don’t want a bunch of stuff! Hello, these are perfect! I find myself in this age category as well! I especially like the door wreath, for someone in a nursing facility! Melinda, I had no idea how essential something like a wreath could be until my dad moved to Assisted Living. These are really great ideas, they would make Dad’s life easier and he would think of you all each time he used them. That large button remote is the best, I need one for the night TV watching, I always hit the wrong thing in the dark, and I would love that calendar, I’m sure my dad would too, I’m always grabbing my phone to see what day it is. So cool. Thanks for the suggestions. I could use that remote too! 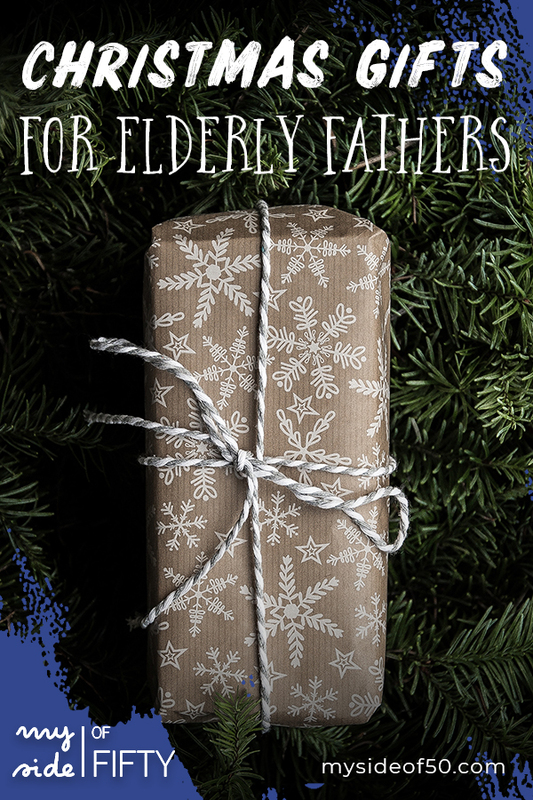 You did so well with your list of gift for elderly fathers. All of those would be appreciated. That’s exciting! I’m glad so many people were interested! Thank you, Kathleen! we all have that sound machine in our house, its the best! Book rest!!!!! That is what my 84-year-old dad needs. You are brilliant. Carla – I love to read in bed, so I may order that bookrest for myself! Fabulous suggestions. With arthritic hands the book rest is a great help! Haralee – that has been the most popular gift in the whole post. Isn’t it great? Cathy, what a great list of thoughtful gifts! Sadly, my dad is no longer with us, but I’m going to keep these items in mind for future reference for other “older” men in my life! Roxanne – I compiled it with my dad in mind. Things that he would have used and enjoyed while in assisted living. Thanks for reading and commenting! Wonderful article! The variety of gifts was spot on….I was was glad to see a few techy items included! Thanks, Heather! Those techie items have been very popular! Great list for a task that only gets harder each year! Michele – it certainly does! So glad you found the list helpful! Thank you so much for the wonderful ideas!!! Amy – so glad you found the post helpful! Samantha – love your suggestions – especially the adaptive clothing!